Hello from Syracuse! Yep, I'm travelling again. But, this should be my last trip for October, and then..... we move into our new house! I'm so, so, so excited that I can't even hardly talk about it for fear I'll jinx it all. We have 22 more days until we get our keys, because we close on our house on HALLOWEEN! How fun is that?! So, before we leave our cute little neighborhood, I wanted to invite the neighbor kids over again to play in my kitchen. 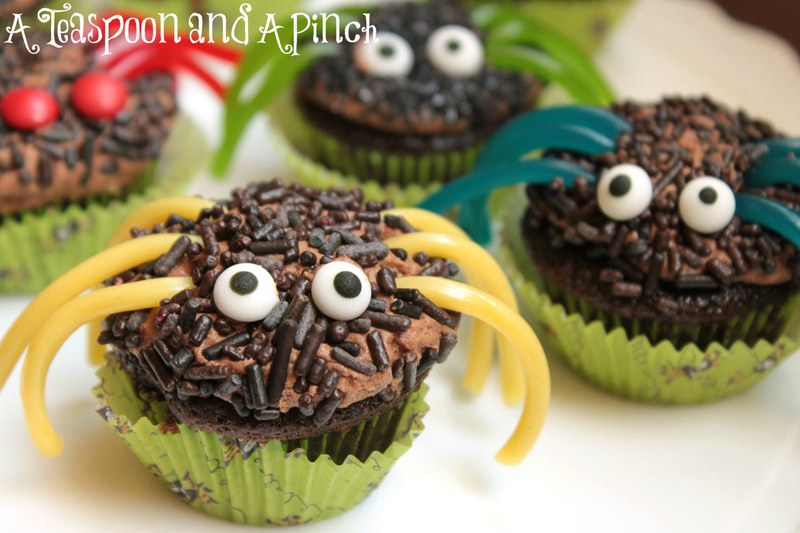 This time we frosted a mini chocolate cupcake with the creamiest of chocolate buttercreams and then poked cute little candy pieces to transform them into silly spiders. And silly little spiders they are, indeed. So fun! An amazing note about the frosting recipe below: The recipe calls for evaporated milk to incorporate the powdered sugar. I didn't realize that I was completely out of evaporated milk, so when I opened my fridge to substitute with 2%, our bottle of coffee creamer caught my eye. White Chocolate Macadamia. Um, yes please! So the girls and I executively decided to swap the creamer for the evaporated milk. And then we poked our fingers into the frosting to give it a taste. You need to do this. Holy moly, it was flipping amazing. Like, beyond yummy. I imagine it would work with just about any flavor coffee creamer, so if you try it, please let us know!! 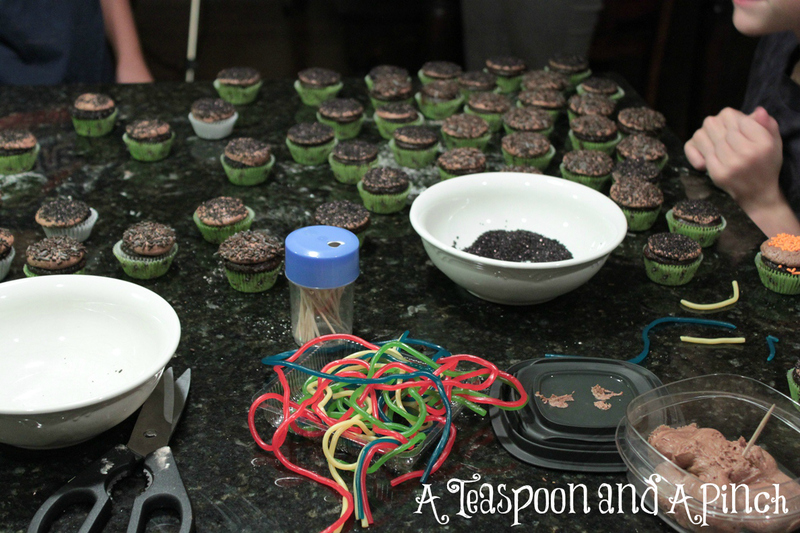 Preheat oven to 350 degrees and line a mini cupcake pan with papers. In a large bowl, whisk together dry ingredients. Stir in eggs, oil, vanilla, and milk and mix until combined. Stir in hot water until combined. Pour batter into mini cupcake pan, filling each liner about 2/3 full. Bake for 15 minutes, or until they pass the toothpick test. Allow to cool completely before frosting. Cool and decorate. Makes approx. 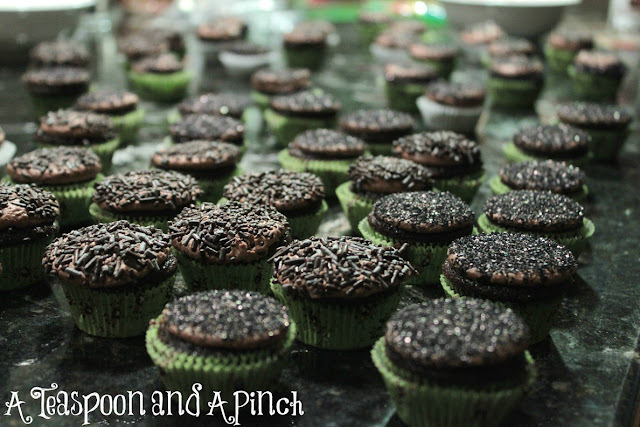 60 mini cupcakes. 6 Tbsp. butter, room temp. In a medium bowl, sift together the powdered sugar and cocoa, and set aside. Using your mixer's whisk attachment, in a large bowl, cream butter until smooth, then gradually beat in sugar mixture alternately with evaporated milk. Blend in vanilla. Beat until light and fluffy. If necessary, adjust consistency with more milk or powdered sugar. Pipe frosting onto cupcakes with an extra-large round tip. Dip frosted cupcake tops into jimmies or sprinkles to coat and to slightly flatten the frosting. Cut licorice strings into equal lengths for spider legs, about 2" each. Poke licorice strings into the frosting. 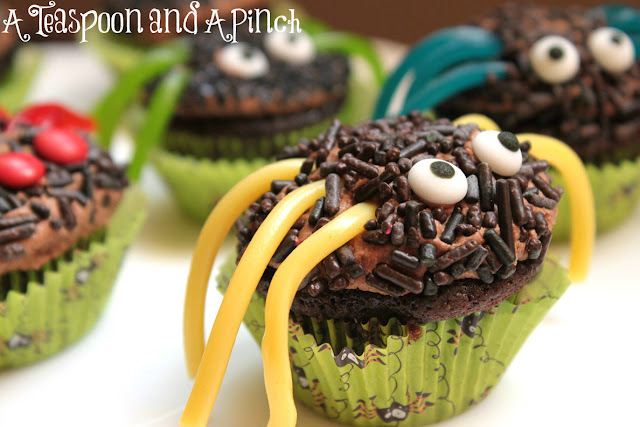 Dot frosting or corn syrup onto the backs of candy eyes or M&Ms and place onto cupcake. 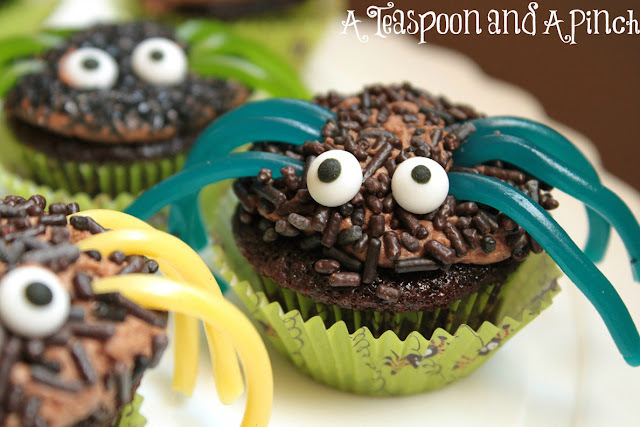 Those are silly spiders, not scary at all. And they look delicious, though I'm not sure I could overcome my dislike of spiders enough to eat them. OK, who am I kidding? I would totally eat those. These are too cool! Love them for Halloween. Congrats on your house too...that's so exciting!